You are here: Home>For children>What's on offer for families? What's on offer for families? Wondering what to do when the school holidays are upon you? Why not come along to our special family drop-in holiday activities. There is no need to book, just turn up between 1pm and 4pm on a Wednesday or Thursday during the school holidays. Who runs the sessions and what age are they for? The holiday activity sessions are suitable for all ages. Each child must be accompanied by an adult. The activities are led by education staff and volunteers. They are held on Wednesday and Thursday afternoons during the school holidays. 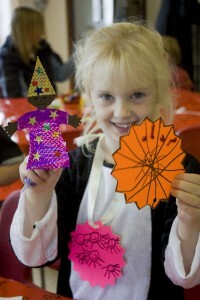 We also run children’s craft and hands-on activities on event days. The activities take place either in our Education Room or in the Stone Barn. Sometimes they take place outdoors in fine weather. Admission prices are Adults £5.00, Concessions £4.00 and all children five and over £3.00. Standard admission tickets are annual passes, granting repeat entry to the museum for 12 months on all but some special event days. Annual passes can be used for entry on family activity days, but we ask for a small donation to cover the cost of craft materials. You may also like to bring a picnic lunch. On activity days the Tea Room will be open selling a range of filled rolls or sandwiches, hot and cold drinks and cakes. There are toilets and parking on site, so you can make a day of it. Don’t wait until the holidays to visit! The museum is an ideal location for a family day out at the weekend and in the afternoon during the week. Many of our annual pass holders like to pop in after school ends to have a run around or explore the site. We have made important changes to allow families to enjoy the site as a family group, with plenty to see, do and discuss for all ages. At the Museum Shop you will find that there is a special entry price for families. Here you will not only find a shop stocked with attractive items for all ages, and all pockets, including ice-cream, but also a range of free activity leaflets to help you focus on the best things in the museum. You can also pick up our returnable ‘Activity Pack’ which has a range of information leaflets, activity sheets, colouring pages, and even a special magnifying glass for explorers who want to get really close to the artefacts. Please ask for one of these at the reception desk. Around the museum you will spot cards which encourage you to ‘Have a Go’. Please do! There is a mixture of activities which will help you to understand the collections more fully. Another place to pause is the Playshed, where younger family members can play with old farmyard toys, a replica village shop, and dress up in historical costumes. Outside the playshed is the Play Area, with picnic tables close by; alongside is the Tea Room (open weekends, Bank Holiday Mondays and on Wednesday and Thursday afternoons during the school holidays) . As well as ‘doing’ there are also many fascinating objects and places to see which will certainly get the older family members talking. The Farm Labourer’s Cottage needs little explanation, as does the Village Life Shop; both are full of atmosphere and memories of not so long ago. The 850-year old Abbey is a fascinating building to explore, with so much to discover, and with the changes of England’s tumultuous history written into its very stones. There is certainly enough on the site to involve a family for a whole day’s visit. And if you don’t have time to see everything, why not drop in again on one of our Event Days, or Family Activity Days?